The five dwarf planets (Ceres in the asteroid belt, and the trans-Neptunian planets led by Pluto)) have demanded that discrimination against them cease immediately and that they be afforded full planetary rights along with the “Big 8”. 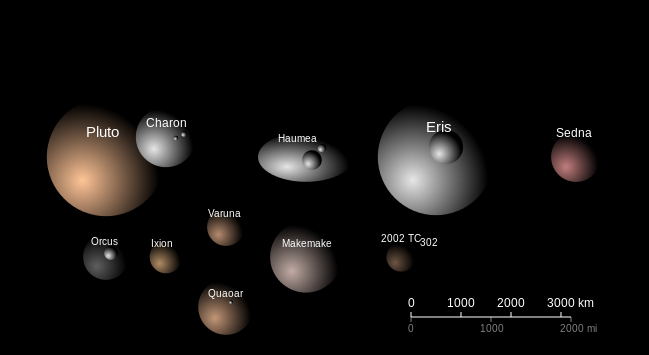 Over 150 bodies are trans-Neptunian planets (TNPs) but only four are recognised as dwarf planets (Pluto, Eris, Haumea, and Makemake). The International Astronomical Union denied any discrimination. A spokesman angrily refused to comment when accused of being geocentric. He denied that the IAU was steeped in dwarfism. This entry was posted on March 26, 2018 at 8:26 am and is filed under Astronomy, Trivia. You can follow any responses to this entry through the RSS 2.0 feed. Both comments and pings are currently closed.